Standard & Poor’s Ratings Services answers key questions about the creditworthiness of China's provincial governments. S&P recently placed the China sovereign rating on negative outlook. Will this rating action affect China’s provincial governments? We are not expecting a serious deterioration in provincial governments' credit metrics in the short term. Our current assessment of their creditworthiness already incorporates our forward-looking view of these entities' economic, fiscal, and debt dynamics. We believe that the central government's ongoing support of provinces will outweigh the downside risks that may arise from higher debt burdens and a weaker economy. In addition, we estimate that the cash positions of almost all Chinese provincial governments may cover 100% of their debt–servicing task for the next12 months. Is the weakening Chinese economy a major concern? The economic slowdown has hit fiscal performances of many provinces hard, and it is possible that revenue prospects for provincial governments may weaken further than expected. At the same time, growth in government fiscal spending shows no sign of abating. Further deterioration in revenue prospects could lead us to lower our assessment of the budgetary performance of local governments. Wealthy provinces, such as Beijing, Guangdong, Shanghai, Jiangsu, and Zhejiang, tend to hold up better during difficult times and their budgetary performances have remained broadly in balance. The provinces with only average income levels have balances after capital accounts around 0% to negative 5%, while Qinghai and Ningxia (the two underdeveloped northwestern provinces) have imbalances of greater than 10%, despite having two-thirds of their revenue supported by transfers from the central government. What is the impact of the government’s debt-refinancing program? China's local government debt-refinancing program, launched in 2015, has significantly enhanced the debt-servicing capacity of provincial governments by deferring principal payments and lowering interest costs. The resulting stronger liquidity position of provinces has been a key support for the sector’s creditworthiness. The debt-refinancing program is designed to restructure approximately RMB13 trillion of non-bond debt (which are mostly short term and bear high interest costs) into provincial government bonds by 2017. 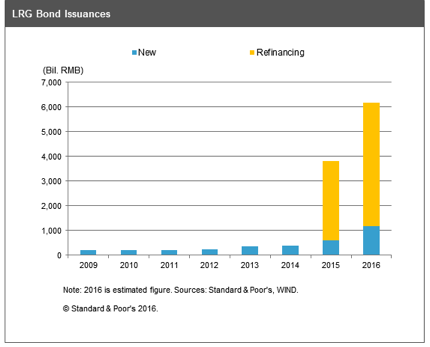 In 2015, RMB3.2 trillion in bonds were issued for refinancing old debt, with another RMB5 trillion to RMB6 trillion to be issued this year and next year (see chart 1). What are the provincial governments' key credit weaknesses? A high and rising debt burden, combined with contingent risks, are the key weaknesses weighing on the credit profiles of provincial governments. Their debt has increased to just under 40% of GDP, from 27% a few years ago. We estimate that their debt burden as a whole was 180% of their total revenue at the end of 2015. This level is high compared with international peers and constrains the creditworthiness of Chinese provincial governments. Given the debt ceiling on provincial governments that went into effect last year, we expect growth in their direct debt stock to be moderate. However, most provinces have set similar or higher growth targets for 2016 compared with that for 2015 to stabilize the local economy, implying that fiscal spending will continue to prop up growth. This will exacerbate the revenue-expenditure imbalance, and build more contingent risks for the provincial governments. What determines regional governments’ resilience to negative trends? The economic strength of provincial governments is a key factor that determines whether they can withstand negative rends. The more diversified regional economies with a larger share of the services sector, such as the financial industry and the strong property sector, may have better tax revenue-generating capacity (see chart 2). For example, we see tax revenue growth rates in Shanghai, Guangdong, Beijing, and Jiangsu above 10%, boosted by their large and relatively more profitable services sectors. Besides tax revenue, land sales affect local governments' fiscal revenue significantly. Beijing and Shanghai are two outliers, with their land sales revenue increasing in 2015 thanks to their top-tier property market, while Zhejiang and Guangdong experienced 30% and 15% declines, respectively. Overall, we expect land transactions to remain sluggish in 2016. The Ministry of Finance forecasts overall land sale income for provincial governments to drop another 13%. Data for February suggests that land sales revenue might have bottomed, possibly due to the strong recovery in top-tier property markets. What's behind the differences in credit profile estimates? In general, the Eastern provinces tend to have better credit profiles than those in inland areas. Most Chinese provincial governments display some common credit features, including a high debt burden, limited budgetary flexibility, and strong liquidity. The primary factors currently driving the differences in our estimated credit profiles are the economic strength and fiscal profiles, which tend to vary more widely across provinces. The economic profile has a significant impact on an individual credit profile assessment in its own right, and it also has a follow-on impact on the fiscal profile. As a starting point, most Chinese provinces sit at the lower end of the income range compared with international peers. However, their economic profiles look quite different after taking into account their economic structure and growth prospects. Although all Chinese provincial governments are experiencing negative economic trends, regional economies with greater exposure to the service sector tend to be more resilient to downward pressure on their fiscal revenue. By contrast, provinces with more exposure to industrial overcapacity and the commodity sectors have suffered most from shrinking economic activity and deflation. What’s S&P's assessment of the relationship between central and provincial governments? We view China's fiscal framework and relations between the central and provincial governments as evolving and unbalanced. continues to take incremental steps to improve its fiscal system, which was largely formulated in 1994. Recent efforts have included moves to improve debt and liquidity management by, for example, imposing a legislated ceiling on local governments' direct borrowing to increase the transparency of their debt position. The progress and the sequencing of fiscal reforms appear to be falling behind schedule. The lack of clear boundaries for economic and fiscal responsibilities between the central and provincial governments remains. Local governments are still facing shortfalls in funding fiscal spending, which their on-budget debt financing may not offset completely. China is aiming to increase local governments' revenue flexibility and is committed to firming up fiscal transfers to local governments. However, these measures are not adequate to address the imbalance.